HTC today announced the launch of Butterfly S built on the same lines as its predecessor Butterfly launched last year but with a difference. The Butterfly S will pack the largest capacity battery in any of the HTC lineup of phones and will run on Snapdragon 600 SoC. The Butterfly S will have full HD Super LCD 3 display with a screen size of 5 inches. The display will be protected by Gorilla Glass 3 and the phone will pack a battery of 3200 mAh which will give users 25 hours of 3G time, 29 hours of GSM time and a whopping 659 hours of standby time. On the insides, the Butterfly S will be powered by Snapdragon SoC with four krait cores clocked at 1.9GHz. 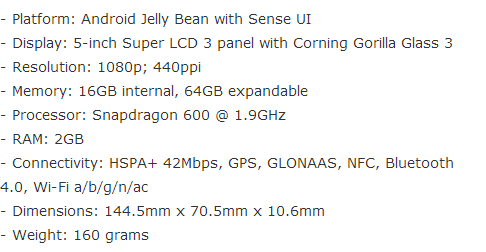 It will have 2GB of RAM and 16GB of internal memory with slot for microSD card expansion. The Butterfly S will come with Android Jelly Bean out of the box with the HTC trademark Sense 5 UI with BlinkFeed etc. It will feature a 2.1MP front camera with support for 1080p video recording and HDR still photography. It will also have the same HTC UltraPixel camera like one on HTC One. 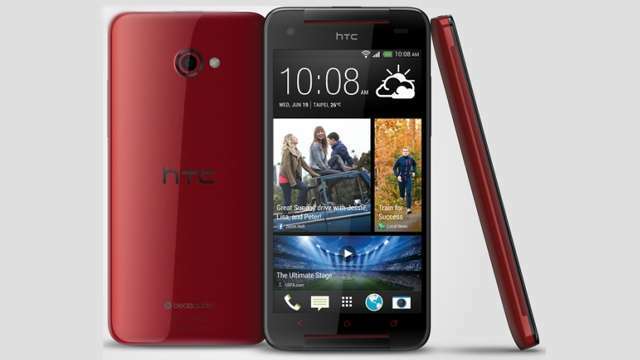 Another huge plus added to HTC Butterfly S is dual front stereo speakers powered by HTC BoomSound. For connections, the Butterfly S will come with support for HSPA+ and Wi-Fi 802.11 a/b/g/n/ac bands. It is DLNA compatible and comes with an IR blaster, support for Miracast wireless display and MHL support in the micro USB port. The Butterfly S also has an NFC chip and Bluetooth 4.0. The Taiwanese retailer Sogi has listed its price NT$22,900.00 which works out to approx $766.00 (Rs.44,000.00) which is to say that Butterfly S wont come cheap. Although HTC has announced that the HTC Butterfly S will be available in select Asia Pacific markets from July the general availability for the larger world is not confirmed yet.